“Kaili Blues” has its Madison premiere at 7 p.m. Wednesday at the Madison Museum of Contemporary Art, 227 State St. FREE for museum members, $7 for all others. Not rated, 1:49, three stars out of four. “Man, have you ever had one of those dreams that are completely real?” That’s a line from Richard Linklater in his 1991 debut film “Slacker,” a movie I kept thinking of as I was watching Bi Gan’s “Kaili Blues.” Both films are from first-time filmmakers, daring but a little shaky in execution, promising great things in the future. And both eschew traditional narrative structure for an elliptical, dream-like story. The dreamer in this case is Chen (Chen Yongzhong), a doctor living in the Chinese city of Kaili. Through scraps of dialogue, we see that he has no wife and children, and his most devoted to his nephew Weiwei (Luo Feiyang). With Chen’s brother, the aptly named Crazy Face, out drinking and carousing, it’s often left up to Chen to play surrogate father. Chen learns that Crazy Face has abandoned Weiwei with a friend in a small river town, Zhenyuan, and Chen heads out on his motorcycle to bring him back. 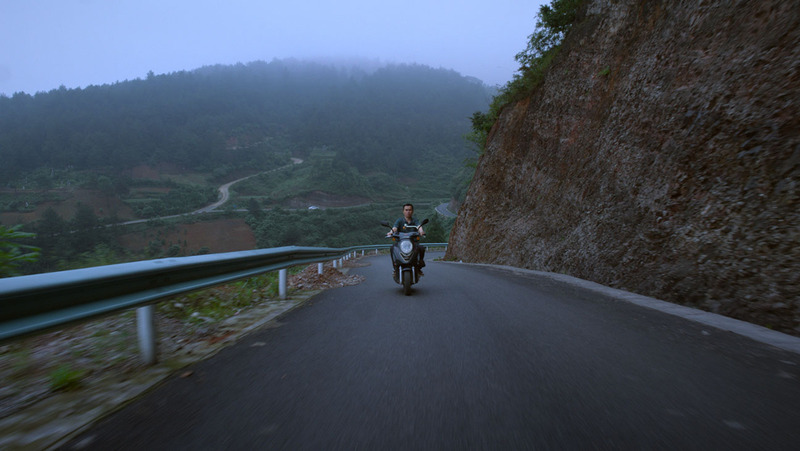 This leads to the most extraordinary scene in the film, a 41-minute single-take shot through the streets of Zhenyuan, as Chen and several other characters cross paths with each other on the way to a small music festival. It also reminded me a lot of “Slacker,” in which characters cross paths on the streets of Austin. As we wander down streets and poke in and out of shops, the sequence feels at once like a documentary and a dream sequence, like a first-person video game. At times we run across something a little surreal, like a man standing in a bucket by the roadside with a bucket on his head. As Chen searches for Weiwei, he’s also on an internal journey into his past, remembering his mother and the old ways of China, fast disappearing in the face of modernization. Everywhere in both Kaili and Zhenyuan, we see construction equipment, half-finished buildings, half-destroyed buildings. The image of a train hurtling by recurs again and again, its thunderous rattling the sound of a country forging headlong into the future, its traditions and memories receding in the distance. Like the films of Thai director Apichatpong Weerasethakul (“Cemetery of Splendour,”) “Kaili Blues” is a poetic, offbeat film that’s of the sort that adventurous filmgoers dream about.